If you are investing in a new landscape, you want it to not only look truly amazing, but to be built with professional quality craftsmanship. Using techniques that ensure proper installation and strong foundations, we make sure your landscape will have lasting beauty. We draw from years of experience in landscape construction and horticulture to create exceptional landscapes. Our goal is for you to be completely thrilled with your new outdoor space. Our landscapes are designed and installed sustainably. We adhere to environmentally friendly principles that help to reduce your carbon footprint while creating natural landscapes that are functional and beautiful. 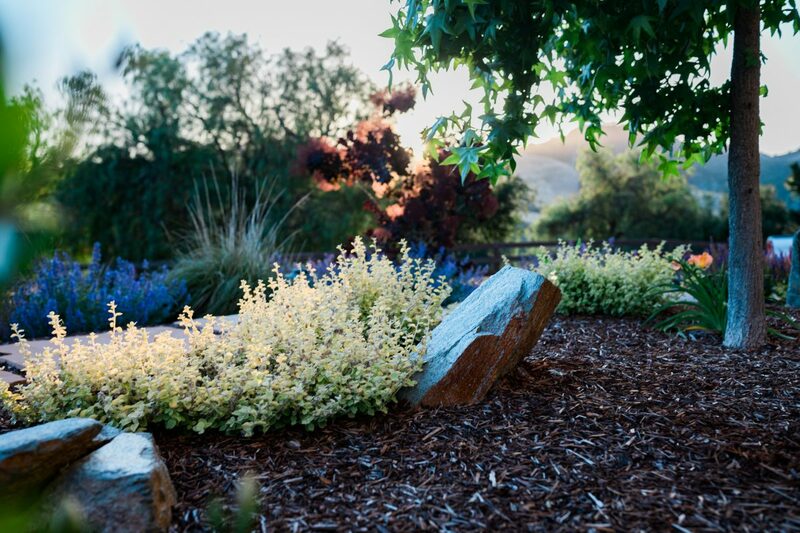 Our landscapes are designed to work in harmony with the geography, climate, and soils of the California. By choosing sustainable landscaping, your new landscape will be easier to maintain and you’ll be doing your part to preserve the environment. What are your primary goals for your landscape installation? How do you envision your new outdoor space? What elements are most important to you? Maybe your goal is to reduce water usage, create a space outside to relax with your family, or simply to enjoy some natural beauty as you pull into your driveway or look out your windows. Whatever your goals may be- it helps to prioritize them ahead of meeting with a landscaper so you can clearly communicate your needs. Are there any specific plants you like? There are so many beautiful options for plants that thrive in our area! If you already know of some that you particularly enjoy, let us know so we can begin to form a palette around them. Plants are one of the most critical aspects of most landscapes, so we place an emphasis on proper selection and placement from the start. Do you want any patios, walkways, or retaining walls? These types of hardscapes often form the foundational elements of a landscape. At Wild Bloom, we build artistic hardscapes the most up-to-date installation standards to elevate your landscaping so it truly stands out. Your material and design options are endless, which is why we’re happy to consult with you to help define a direction that’s right for you and your home. Would you like an outdoor kitchen or space for entertaining guests? Outdoor kitchen islands, dining areas, fire pits, patio seating, and patio covers can be used to create a comfortable outdoor room for get-togethers with friends and family. 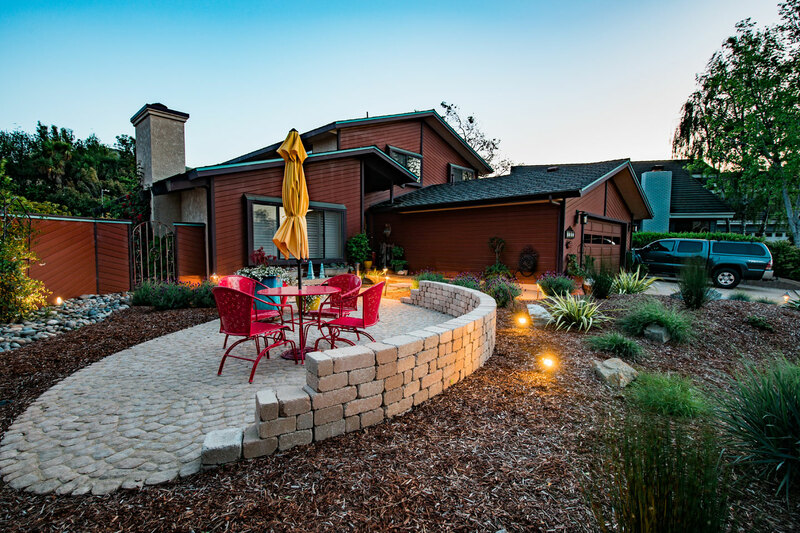 Having these landscape features in place makes it easy to get outside and enjoy our beautiful California weather. Do you need a lawn area? Traditional lawns require a serious amount of water and maintenance. If you have kids or pets that need a lawn, you can opt for a low water alternative rather than a traditional lawn. We highly recommend Kurapia, a new type of lawn that requires very little water and maintenance. In fact, it only grows a couple inches tall so it never needs to be mowed! It looks great and can even be installed as sod for immediate gratification. Other eco-friendly lawn options include native Carex grass, or simply reducing the size of your existing lawn. How can your landscaping be customized for your lifestyle? Interested in raised vegetable beds? How about saving water with rainwater catchment? Would you like to create more privacy with screening plants or fencing? Take a good look at your outdoor space and consider what elements are most important to you. Those details are important to ensuring long-term satisfaction with your landscaping.